← Carillion: a one-off or a symptom of a wider malaise? The collapse of Carillion has brought corporate governance back into the headlines and with it the perennial questions about the short-termist nature of British business. Merryn Somerset Webb was in fine form, having a go at managers, analysts and shareholders alike; “short-termism at its worst”. The collapse of construction and support-services group Carillion has left a lot of people with a lot of explaining to do. First up, the UK’s equity analysts. Even in 2015, says the Financial Times, two-thirds rated Carillion’s shares a buy – despite warning signs in its accounts. The managers are also in the firing line. Why on earth were they taking huge bonuses in the face of a failure they surely saw coming? Why did they take on so much debt (if there is one lesson for investors here, it is to avoid companies with high levels of debt)? And why did they keep paying dividends, even as their cash-flow woes mounted? The UK’s institutional shareholders are hardly blameless either. They bore on endlessly about how they take a long-term view – so why were they demanding those dividends from a firm that was clearly stressed? Short-termism at its worst (see this week’s cover story for more on firms who pay dividends that they probably shouldn’t). Income investing has a long history in Europe, more so than in the US where investors are far more willing to support companies that pay no dividends at all. As a result, institutional shareholders in the UK have over generations created a culture of dividend worship that has pretensions to valuing long-term investment, but in fact frequently enables some of the worst forms of corporate short-termism and mismanagement. This has led to a frequent pattern in the UK market, where companies will doggedly maintain their dividends even when their business models are under threat because of the knowledge that a cut will very frequently result in a chief executive being fired. Over the years, a number of reports have made the link between the UK’s poor economic performance and the short-term focus of corporate executives and investors. One of the most comprehensive was John Kay’s review in 2012 which, as you might expect, met with mixed reviews from the investment industry. It is certainly true that the UK has low levels of investment relative to other developed economies. In November, the Office for National Statistics reported that the UK was at the bottom of the OECD investment league and has been for most of the past two decades. Looking back further, the UK’s investment relative to GDP began to fall away from that of other similar countries sometime around the early 1990s which, ironically, is when the first of a wave of corporate governance reports was produced and the framework which became our corporate governance code was created. When we look specifically at research and development, the picture looks even worse. The UK has consistently invested less than other major economies. Meanwhile, payments to shareholders have generally been higher in the UK than in other developed economies. Kyle Caldwell, the Telegraph’s personal finance reporter, remarked on this a couple of years ago, noting that payouts to shareholders as a percentage of company earnings were relatively generous. I have updated his chart with more recent data. Apart from the recession period, UK firms have paid dividends at a higher rate than in other markets and considerably higher than in the US. The historic data on Page 15 of this University of Chicago paper suggest that a similar pattern held true for much of the last 100 years. Publicly traded companies have loomed larger in the UK economy than in most other developed economies for some time. McKinsey’s report on short-termism in US firms last year found that those firms with a more short-term focus invested less and, over time, performed less well than those with a longer-term view. The study also found that a majority of executives believed the pressure to deliver short-term results was increasing. Andy Haldane, the Bank of England Chief Economist, reckons something similar is happening in the UK. The other side of the coin to high pay-out ratios from internal funds is low investment. There is both direct and indirect evidence of investment having been adversely affected by short-termism on the part of either investors or managers or both. Chart 6 shows some diagnostics for a matched sample of public and private UK companies (Davies et al (2014)). In line with US evidence, it suggests that investment is consistently and significantly higher among private than public companies with otherwise identical characteristics, relative to profits or turnover. In other words, shareholder short-termism may have had material costs for the economy, as well as for individual companies, by constraining investment. Overall, then, there is some strong evidence that corporate short-termist behaviour is, in Andy Haldane’s words, “far from benign”. In the UK we seem to have a particularly severe case of it. [T]he shift to equity-based compensation practices in the 1980s and 1990s addressed one incentive friction – the principal/agent problem between shareholders and managers. But it may have done so at the expense of amplifying other incentives frictions – for example, it may have amplified risk-shifting incentives from shareholders to creditors and to wider society. Linking the remuneration of corporate managers to shareholder value was supposed to have reduced the risk of executives managing companies for their own gain and aligned their interest with those of shareholders. Most observers now agree that it made the problem of short-termism worse and often didn’t work particularly well for shareholders. In 2009, Jack Welch, one of its early proponents called it “the dumbest idea in the world”. Might something similar happen if corporate governance regime were altered to favour a broader range of stakeholders? As Stian Westlake said, reflecting on the Haldane speech, employees might prove risk-averse, preferring to save their jobs for the next few years rather than risk an investment that might only pay off years later. Likewise, customers might prefer continuity and low prices to the promise of innovative products in future. Furthermore, while we often imagine shareholders to be individual investors, nowadays few of them are. Just as there is separation of ownership and control in companies, there is a separation of ownership and control in the investment and management of shares. Many investors have only a vague idea of which companies their fund managers are putting their money into. As the Kay review noted, in 1963 individual investors owned 54 per cent of UK firms. That figure is now around 12 percent. It is possible, and in fact common, for each of these rights of ownership to be held by different people. Out in the open market, cold-hearted, distant investors count on liquidity to realise the ‘outperformance’ they promised their clients. And in this harsh climate, no steward can survive. So, yes, we do seem to have a problem with short-termism in the UK that is affecting our wider economy and the country’s long-term prospects. Carillion was en extreme example of it. But I’m not convinced that changes to the corporate governance regime, even major ones, will make much difference. After all, we have implemented a new corporate governance code every few years for the last quarter century. OK, things might be been worse if we hadn’t but, whatever else it might have achieved, the overall long-term investment picture looks pretty much as it did 20 years ago. Even our 1990s and 2000s productivity catch up may turn out to be ephemeral. Having said all that, I’m happy to be convinced otherwise. Answers in the usual place please. Whoa a lot of this way too advanced for me but I think what”s changed since the 80’s is the role of the state in pure research. A lot of the work I would say is the job of the state in the US is done by Telsa. In the UK it doesn’t seem to be getting done at all. Science for science’s (as 100cc almost sang} is a beautiful thing. What comes next should be down to private sector to work it’s magic. I think the link between the state and corporations is broken. Surely we can test this theory by looking at cooperatives? If it were the case, we’d expect to see both relatively low levels of capex by coops that sell into the wider market and member coops priortising discounts over R&D. I don’t have the data, but I suspect the coop sector is not that much different to the rest of the UK economy, particularly if you exclude anomalous sectors like oil & gas and financial services. On the wider issue of governance, many Plc boards spend more time discussing dividends, LTIPS and share buybacks, not to mention M&A opportunities, than they do on capital investment. This looks like a reflection of the primacy of shareholder value, which encourages short-termism. That said, this is an old problem, with roots in the late 19th century, and one that has been exacerbated over the last 50 years by the decline of regional banking at the expense of the City. One thing we do know is that capital allowances and R&D tax-breaks have a limited effect. An improvement in capital investment, and thereby productivity, will ultimately require greater capital controls and more restraints on takeovers. Surely the appropriate question is not “why is the UK short-termist” but “why is the UK more short-termist than the USA?” It is the same people investing in the US markets and the UK markets, the same people generally making decisions about R&D, and if not the self-same people they have all been to the same business schools, so why are the two sets of stats so noticeably different? Someone on Twitter pointed out that if one takes into account share buybacks UK and USA companies distribute the same percent of cash flow to shareholders and management (share buybacks in the USA are the way companies pay out bonuses to management, for tax reasons and to obfuscate how much the management take out of the business). Seems plausible, and not a surprise, because a lot of businesses in the USA too have adopted “sweat the assets” strategy too. The two most profitable business activities in both the USA and the UK for decades have been: resell imported products, japanese at first and chinese after, and leveraged property speculation. Both require much less capital than industries that make manufactures or services. Ah I forgot another very profitable business: resell imported labour, as in third world or eastern european or mexican, in low-wage service industries. That does not require a lot of capital either. A vast amount of that is due to defined benefit pension funds wanting those big dividends to pay out pensions to their beneficiaries. This has translated into pressure to squeeze hard the wages and pensions of current workers to pay earlier workers who retired, which I suspect was one of the goals of having most pensions be occupational instead of provided by state bodies like in most continental european economies. This is a very strong phenomenon amongst 50-ish middle and top executives, especially when they are a majority like in companies of recent formation, and has meant that most tech startups eventually fail 30-40 years after they were founded: when founded most founders and employees are in their 30-40s, 20-25 years later as they see retirement looming they turns their companies into cash cows to create large book profits, from which to pay themselves big bonuses and award themselves large pension contributions; they usually do this by both cutting investment in new products and raising price and cutting support for old products, milking their existing captive customers as hard as possible. This means that in 10-20 years those customers will move to another supplier, but by that time the first wave of founders and top and middle executives will have retired in vast luxury, and too bad for the business. That is actually something that happens in most companies, but many companies have more than one product line and the self-dealing cycle of the middle and top executives are often not aligned, so while one product line is being milked into oblivion, another expands. This is not a new story, but the graphs here are quite welcome because they make it clear. However they are about *averages*, and I suspect that this hides a small number of companies that do as much capital investment and R&D as continental companies, and most that do virtually none, and just “sweat their existing assets”. As to “sweating” assets, it is a very old story — already in the 1920 english industry was declining, and that continued (e.g. JB Priestley’s “English Journey” of 1934, very recommended but for some politically incorrect parts), and the reports were that many, many business still used equipment from the industrial revolution, and processes that were equally old if not from the time of the Hansa. During a recent visit to the Steam Museum of Swindon, where once a dozen thousand workers built railway stock, and that is mostly now a sparsely staffed shopping centre, I noticed how the illustrations that demonstrated how the plant operated showed 19th century equipment and conditions still in use in the 1950s. I suspect that english proprietors started sweating their assets in the late 19th century, and considerably reduced their investments in England around 1905, and have continued doing so. My impressions it that for a long time english proprietors have thought that they could get better returns abroad, with cheaper workers in growing economies, and they went through waves of domestic asset stripping to fund foreign investment:: first in the plantations of the English Empire, then at the beginning of the 20th century in the booming USA industrial economy,. then even more once trade unions and the Labour party arose post WW1, and even more so after WW2 and Attlee’s government. A Clark in his excellent “Conservatives and the Nation State, 1922-97” talks of how as WW2 started it was funded by taxing and then selling the asset of the wealthy, which were all in USA based investment accounts and properties. My further suspicion is that the anglo-saxon elites have applied the Bain Consulting Group matrix to regions of countries and entire countries, not just to individual corporations, and they have classified most of the UK regions as “dogs” or at best “cash cows”, and have been “sweating” them hard, to fund investments in the “stars” of the developing world or the “question marks” of the tech boom, because profit rates abroad are much higher than in the UK, except for property. The only reason many (pretty small) investments were made in the UK was to game the EU’s rules-of-origin in a relatively low wage, no-union location, and that is going to disappear. if these reflect economic activity, as they have always done, then Spain, the UK, Greece and Italy have been in big trouble since 2003-2005 and the UK has a quasi-ex-soviet moment during 1980-1990. Oops, there is a missing bit in my post: if the collapse in electricity consumption starting 2003-2005 is indicative of actual economic activity, it may mean that large chunks of the economies of first-world countries have moved,. after the WTO entry of China, eastward, in which case the “short-termism” (“sweating assets”, “asset stripping”) we have seen so far will seem as just the beginning. 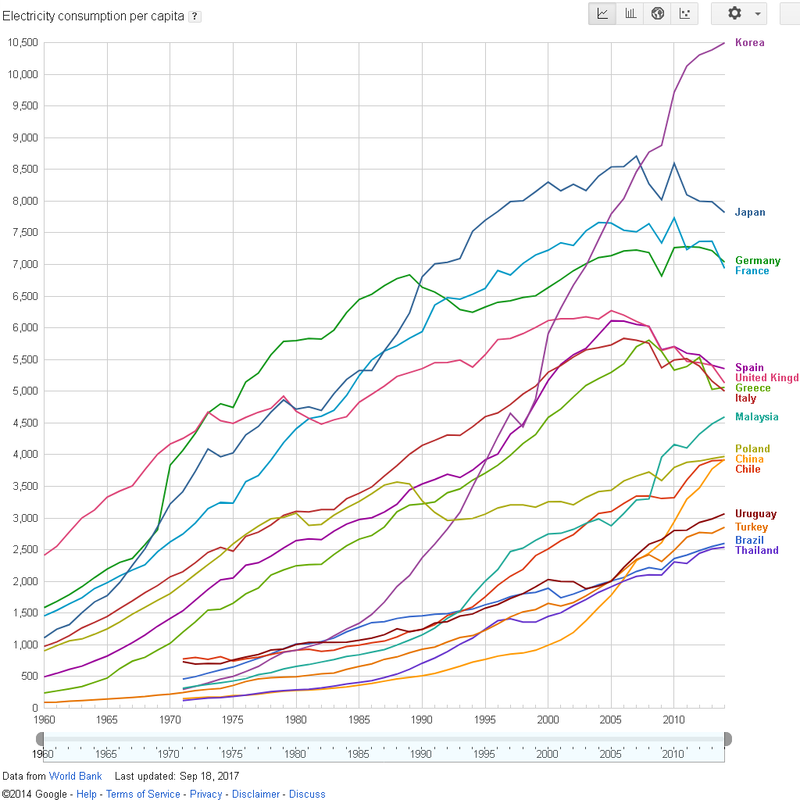 Also note that in some developing countries the rates of increase of per-capita electricity consumption have been much higher than in the “developed world” for decades. The large falls in the german and polish consumption 1990-2000 are obviously due to the collapse of the communist government and economy in east Germany and in Poland, where “asset stripping” and even “asset destruction” reached enormous levels. On a smaller scale the same happened to the UK in 1975-1985. Well that would certainly explain the massive London bias of infrastructure. Overall an impressive set of comments that make a compelling case. Well, essentially all politicians own property in the M25 area, and many of them, especially the more established tory political and business dynasties, own whole portfolios of property in that area, and so do their relatives and mates. The argument is that London is the last remaining business cluster in the UK, and that may be true thanks to thatcherism, but the article uses that point to say that therefore it must be subsidised at any cost (to the rest of the country of course). NN Taleb argued fairly accurately I think that over a full business cycle the losses of finance during the “crisis” part of the cycle actually exceed the profits made during the rest of the cycle. But that does not include the stupendous “decent living” incomes that traders and executives in finance take out of their employers, so in effect finance loses money (which is made good by the Treasury and BoE) over the cycle to fund the lifestyles to which traders and executives have entitled themselves. Then reflect on that “the best hope the next generation has of earning a decent living”: there are less than a hundred thousand “decent living” jobs in finance, perhaps including professional services a few hundred thousand. The argument here is transparently about the “next generation” of the London (and only sometimes elsewhere) upper-middle classes (and those parts of the upper classes who feel like working), to whom those jobs with a “decent living” usually go. The point of view of those elites, as so candidly revealed by “The Economist”, seems to be that fantastic amounts of public investment in London and bailouts with public money of the City employers of the upper-middle classes and upper classes are desirable to boost the “London cluster” so that their children will have fantastically well paid jobs to take in that cluster, and screw everybody else. I suspect the short-medium term solution is to target this: “listed companies are a more significant part of the UK economy than most others”. When ownership (as in the listed model) finds it easy to sell up and move into owning some other company then you’ll get short-termism. Corporate governance can make a difference around the edges, and long-term you can build a different culture of large company management (as in some other countries – although of course this brings it’s own problems.) But in the short-to-medium term (and indeed in order to start shifting the culture) what is needed is incentives for other forms of ownership. 3) We need to re-consider some of the advantages we hand to listed companies over unlisted ones. This is a job of fine judgements, but that’s how rebalancing works. An obvious area for examination is corporation tax, financial vehicles and the definition of expenses, all of which favour the large over the small – and not all for bad reasons, but we need to be aware of the balance. 4) Lot of useful work could be done solidifying the legal and financial status and processes of co-ops. This would help make this alternative more viable. 5) There’s a lot of intellectual work to be done to try to solve some of the practical problems of co-ops, notably a the conflict between a jobs-for-life model and the modern economy which is much less friendly to that.